Designed for children ages 1-5, Squiggles Seating System is suitable for use as a home chair, school chair or with a mobility base. Squiggles meets all the postural, function and practical requirements of a seating system for young children with special needs while maintaining a fun, colorful design. The pelvis is held in a neutral position with the four-point pelvic harness. Further enhance pelvic stability with Squiggles' flexible sacral cushion that can be shaped to support the sacrum. The ramped cushion maintains the alignment of the pelvis and thighs, along with the other pelvic stability features to keep the neutral position of the pelvis. Squiggles' trunk and head support is enhanced with the addition of the shoulder support, providing increased shoulder protraction, and therefore midline positioning of the upper limbs. 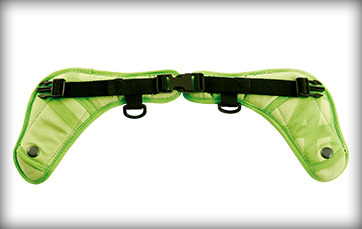 When minimal additional trunk support is needed a small chest harness can be attached to the lateral supports. If greater trunk support is needed, a trunk harness can be attached. 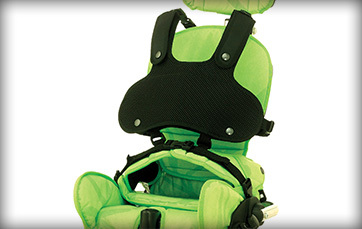 The shoulder sections of the trunk harness can be released separately for upper limb activities. 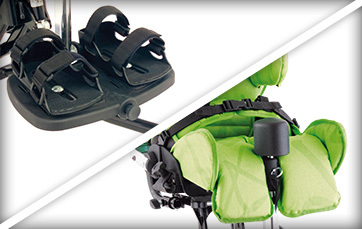 The one-piece footrest with optional sandals ensures maximum stability and allows for growth. Adduction features and optional pommel allow for optimal upper leg positioning. Squiggles Seating System was designed with both the child and caregiver in mind. 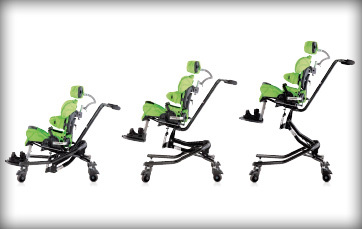 A 1", one piece seat base cushion ensures comfort so the child is able to focus on other activities. The removable, machine washable cushion cover makes it easier to clean while the tools sent as a standard help prevent loosening through continued use.